Piquersa Maquinaria, S.A. - POLAND, NEW EUROPEAN MARKET FOR PIQUERSA MAQUINARIA, S.A.
Poland is the new market in which PIQUERSA extends its European presence and does so by appointing a dealer and the service of a new BA-2300H. 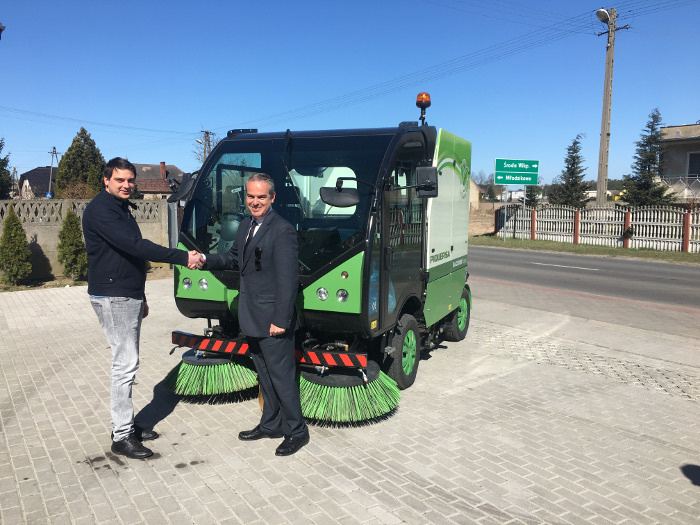 The distribution agreement was signed the last May with the company Komunalny.pl S.C. who has carried out a strong campaign to present the PIQUERSA sweepers throughout the national territory. For this purpose, a demonstration tour was organized for the main Polish operators and an advertising campaign in the main specialized media. The result of the strong commercial effort of Komunalny and Piquersa has been the delivery of the first BA-2300H, which is already working. Komunalny.pl S.C. has a strong presence in the public sector and a clear commercial vision, offering only the best brands and with the best technical service. The climatic conditions in Poland promote the presence of large quantities of sand on streets and roads, so the suction sweepers have greater problems with this kind of cleaning than PIQUERSA sweeper. The perspectives for the Polish market are high and we will be able to see more Piquersa units in its streets soon.